There is no doubt that the high blood pressure is a major risk for coronary heart disease such as angina pectoris, heart attack, stroke, and chronic kidney disease. High blood pressure is a condition that causes pathological changes in the heart. Hypertension increase heart and reduces the kidneys. Patients with high blood pressure have a five times greater risk of coronary heart disease and twenty times higher risk of cerebrovascular death. To understand what high blood pressure means, we must first know what is blood pressure. Blood pressure is actually the pressure in the arteries of the human body which occurs as the heart works, when the heart pumps blood through the large arteries that branches out into smaller arteries and capillaries, which continues to supply the body with blood enriched with oxygen, after that, the blood returns to the heart through veins. The blood coursing through the arteries creates a pressure on the walls of blood vessels, and this pressure is called arterial pressure. This pressure must be strong enough to provide sufficient blood flow during activity and during relaxation. Arterial pressure is resulting from displacement of blood into the aorta in the left ventricle of the heart and blood pushing through the pulmonary valve into the pulmonary artery and then into the right ventricle of the heart. Another pressure arteries produce when they create resistance to the flow of blood. If the capillaries are wide open, blood can flow easily through them. 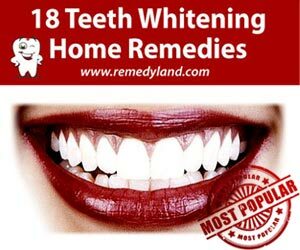 However when the capillaries are narrowed, blood flow through them is more difficult and he increase the pressure in the capillaries and then appears high blood pressure. 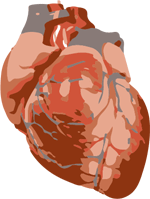 The increased blood pressure can cause damage to the arteries and heart. Arterial pressure is divided into systolic pressure or maximum pressure value at the time of contraction of the heart and diastolic pressure or minimum pressure at the moment when the heart relaxes. If we try to define hypertension we can say that criteria for the diagnosis of hypertension are controversial, because the blood pressure increases with age and varies from one person to another. The large number of authors believes that hypertension is present if the diastolic pressure constantly exceeds 100 mm Hg in people over the age of 60, or 90 mm Hg in people with less than 50 years. It is thought that the vascular complications of hypertension results from an increase in blood pressure. 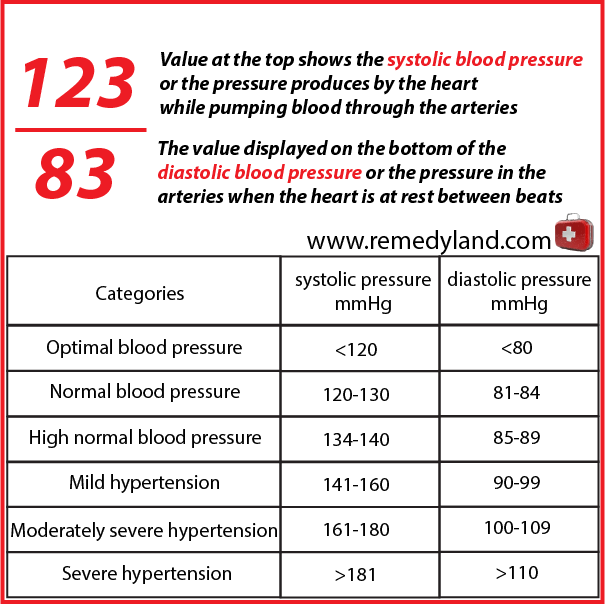 Systolic blood pressure above 200 mm Hg is an extreme blood pressure, and is considered to be a malignant hypertension. Hypertension that did not lead to obvious changes of the heart is not called the “hypertensive vascular disease.” But when they left ventricular hypertrophy exists, heart failure and coronary artery disease, “hypertensive vascular disease” is the appropriate term. Any form of hypertension is uncommon before the age of 20s. In young people is often caused by chronic glomerulonephritis, renal artery stenosis, pyelonephritis, or coarctation of the aorta. Primary hypertension is in about 85% of cases, there is no identifiable cause of hypertensive vascular or cardiovascular disease. Primary hypertension usually occurs between 25s and 55s years of age. In the family history, information is usually found on hypertension (attacks, sudden death, heart failure). Primary hypertension is more frequent in women than men. Changes in pressure in the early stages are temporary, but later the pressure is steadily increased. Even in cases where there is a proven disease, it is possible that the pressure changes, depending on emotional stress, especially anger, insults or defeat. Blood pressure is lower when is measured in patients who are lying at home compared to case when patients are being examined in the clinic. It is also lower whan blood pressure if measured in patients during daily activities. It is not yet established what values should be taken as authoritative. Warning: All the above mentioned is true for other forms of hypertension. The diagnosis of primary hypertension cannot be determinant solely on the basis of its repetition and examination of specific causes. The functional significance of these changes can be determined using the Howard-Stamey test, showing decreased concentrations of sodium and increased osmostat in urine on the side that is affected. Parenchimal – chronic glomerulonephritis and pyelonephritis are the largest group so far known causes of hypertension. Less frequently is the unilateral pyelonephritis, but he can be surgically treated. In rare causes are also included polycystic kidney and congenital or acquired obstructive hydronephrosis. Acute glomerulonephritis is frequently associated with hypertension. Endocrine – pheochromocytom is the tumor of suprarenal medulla gland or (less commonly) chromafinog tissue, along the fiber. Causing persistent or intermittent presence of hypertension, norepinephrine or epinephrine in the bloodstream. Hypertension may cause and Cushing’s syndrome, primary aldosteronism, 17 hydroxylase deficiency, congenital adrenal hyperplasia with virilism and overdose with deoxycorticosterone in the treatment of failure of suprarenal gland followed by eosinophilic pituitary tumor that causes acromegaly. Coarctation of the aorta – a congenital constriction of the aortic arch is leading to hypertension in the upper extremities and carotid arteries. Blood pressure in the legs is normal or decreased. Various effects – hypertension with different strengths is encounter in the labor with expressed toxemia, then in the case of tumor or hematoma which would lead to increased intracranial pressure, overdistension of the bladder and in the late stages of polyarteritis , disseminated lupus erythematosus and scleroderma. Gestational hypertension occurs during pregnancy in women who had normal pressure and may present with preeclampsia, which usually occurs after 28 weeks of pregnancy followed by a high pressure for a period of a few hours, gestational hypertension is characterized by the appearance of proteinuria and edema, as pregnancy progresses and edema growth and eclampsia, the difficult situation of the above mentioned symptoms. Malignant hypertension – any form of persistent hypertension can become dangerous. Diastolic pressure that rises above 130 mm Hg can leads to a pronounced necrosis of arterioles, then progressing of renal failure, and papillary edema. Papillary edema may precede renal insufficiency. The term “malignant” is used because the mortality rate is very high and approaches 100% within two years, if it is not treated. Pathogenesis: essential and renal hypertension are caused by increased resistance in the peripheral arterioles. The mechanism of this occurrence is, at present, unknown. 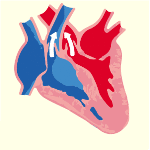 Until the occurrence of heart failure or edema, cardiac output is reduced. Suprarenal substances may have a role in essential and renal hypertension, but this has not been proven in clinical practice. In pheochromocytoma, hypertension is caused by various factors, increased cardiac output and peripheral resistance resulting from the presence of epinephrine and norepinephrine in the bloodstream. There is no known reason for hypertension due to suprarenal gland glucocorticoids, aldosterone and deoxycorticosterone. Hypertension in coarctation of the aorta depends directly upon constriction. Left ventricular eject the blood in a one “small chamber”, although renal function may also be involved. Persistent hypertension leads to reversible constriction of arterioles at first, but later these changes become permanent as a result of intimal thickening, hypertrophy of the muscular fibers and hyaline degeneration. In malignant hypertension, arterial necrosis (particularly in renal blood vessels) is developing rapidly and is responsible for the formation of acute condition of renal failure. Secondarily leads to left ventricular hypertrophy and failure, as well as a change in the arterioles. Hypertension accelerates the atherosclerotic process in the coronary and cerebral arteries, frequent consequences are manifested in the occurrence of myocardial infarction and cerebral hemorrhage or thrombosis. Clinical and laboratory findings were mainly focused on the degree of vascular deterioration as well as deterioration of important organs: heart, brain, kidneys, eyes and peripherals arteries. Symptoms include mild to moderately expressed essential hypertension and it is well tolerated. Indefinite symptoms occur after the patient find out that he have “high blood pressure”. Suboccipital pain occur early in the morning and maintained all day and it is possible to expect any type of headache (including even simulating migraine). Other common complaints include: dizziness, feeling of heaviness in the head, fatigue, loss of energy, palpitations. These symptoms occur due to concerns about the presence of hypertension or because of associated psychological stress. Patients with pheochromocytomas, who are predominantly secrete norepinephrine, usually have persistent hypertension. Release of catecholamines leads to attack (which can last a few minutes or hours) of acute anxiety, palpitations, deep respiration, pallor, chills, nausea and vomiting. During the attack, blood pressure increases and can develop angina or acute pulmonary edema. In primary aldosteronism, patients can have return episodes of muscular weakness or paralysis, paresthesia, and polyuria nocturia. If the heart is affected, then there is paroxysmal nocturnal dyspnea or asthma with or without symptoms of chronic insufficiency of left ventricular. You can develop angina pectoris or myocardial infarction. Renal changes do not lead to very pronounced symptoms. Nocturia is possible or hematuria. Peripheral arterial disease often leads to intermittent claudication. When the terminal aorta is affected by narrowing there is pain in the buttocks and lower parts of the back, while walking, and men become impotent. Changes in the brain lead to hemiplegia and aphasia due to thrombosis, or sudden bleeding that can lead to death within a few hours or days. In malignant hypertension (and occasionally in her absence) severe headache can occur, confusion, coma, convulsions, impaired vision, transient neurological signs, nausea and vomiting (hypertensive encephalopathy). The mechanism of formation is not known. Some role in the formation may have cerebral edema and if you take the treatment, the changes are reversible. Physical signs depends on the cause of hypertension, its duration, intensity and the level of damage to life saving organs. The diagnosis of hypertension can not be set in patients under 50 years of age as long as their blood pressure does not exceed the value of 140/90 mm Hg, or when the patient needs to rest for at least 3 times for 20 minutes or more, and this is in the family environment. During measurements of blood pressure in the normal way, values may be higher than when there is no hypertensive disease, because of the peace, blood pressure returns to normal, it is in fact vascular hyperactivity, not hypertension. Keith & Wagner (KW) classification of changes at high blood pressure has prognostic importance and fits well with the clinical course. KW4 = No matter which of the above mentioned and papilloedema, optic disc elevation, cavity obliteration, and blurred edges of the disc. Malignant hypertension is always associated with papilloedema. 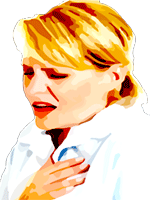 Heart and arteries – Loud second tone over the aorta and systolic murmur can be heard. The disease can be prove by existence of increased left ventricle. Failure of left ventricle can be observed and changes in basal lung nodule. Pulse – It is necessary to make direct comparison of the pulses in the carotid, radial, femoral, and popliteal arteries and arteries in the foot. It is necessary to note the presence or absence of pulse in major arteries, including the abdominal aorta and iliac arteries. Blood pressure should be measured in both, arms and legs. Brain – Can be found neurological signs of cerebral thrombosis or hemorrhage. From neurological signs, it is present a positive Babinski sign or Hoffmann’s reflex and sometimes pure hemiplegia or hemianopsia. Hormonal status – If there are signs of Cushing disease it’s required to note them, full body obesity, hirsutism, acne, the presence of suprarenal gland tumors. In primary aldosteronism there is also flaccid paralysis and muscular weakness or absence of tendon reflexes. Coarctation of the aorta – Femoral artery pulse is weakened or extended in comparison with the radial artery pulse. In young people, mentioned finding, confirms the diagnosis of coarctation of the aorta. The diagnosis is confirmed by the presence of basal murmur which is transmitted in the interscapular region. Also collateral arteries can be palpated along the lower edge of the ribs and the especially around the scapular edges. Parenchymal renal disease – Patients have the look and smell of a person who is ill from uremia. Polycystic kidneys are large and may as well be palpated. Routine examination of urine may show low specific values that signify parenchymal kidney disease or nephropathy in primary aldosteronism. In both cases, the PNP has increased due to progressive uremia and can lead to anemia. However, in aldosteronism potassium concentration is low, while the sodium concentration and C02 are increased, opposite finding is possible in uremia associated with primary renal disease. Nephrosclerosis is accompanied by proteinuria, granular phenomena and occasionally with microhematuria, on the basis of these elements, it can not be differentiated from chronic nephrite. If during the examination bacilluria can be found, that goes in favor of chronic pyelonephritis. Less common are changes in leukocytes. Piuria is not a common finding. All patients must performed quantitative cultures of pure samples and repeated it in intervals, because in chronic pyelonephritis, bacilluria can be occasionally present. If the clinical picture supports the Cushing’s disease, or pheochromocytoma, it is necessary to determined quantitative of 17 Hydroxysteroide and 17 Ketosteroide in urine. It is not necessary routinely to determine aldosterone in the urine. The diagnosis is confirmed with biochemical analysis. The radiograph may reveal a little hole in aortic coarctation and degree of magnification of the heart that is caused by hypertension. Intravenous urography can inform us about the relative size of the kidney, changing in the position of the kidney and the presence of obstruction. Based on ECG we can determine the degree of hypertrophy of the left ventricle and signs of impaired viability in the coronary arteries and prolonged Q wave. In the aldosteronism a Q-T interval is prolonged. Periodic ophthalmological examination are advisable, ECG to determine the condition of the heart and kidney, radiography of the chest, PSP excretion, NPN, urine specific gravity, as well as the determination of protein in the urine. In this way it is possible to monitor disease progression. Many patients with hypertension, especially middle aged women, feel good and do not cure hypertension. Therefore, it is necessary to be cautious in terms of decisions and advice on treatment. Hypertension has a different weight in relation to different patients, and therefore treatment should depend on the degree of severity of hypertension and the presence of complications. The following complications are described under congestive failure: coronary, cerebral, renal, angina pectoris, myocardial infarction, cerebral hemorrhage, cerebral thrombosis and renal failure. There is no known reason for headache in hypertension, except in cases of accelerated or malignant hypertension. Suggestions and explanations are often helpful. Obesity does not necessarily have to be accompanied by high blood pressure. However there is a strong link between obesity and high blood pressure. Obese people have three times more likely high blood pressure compared to normal weight people. Obese people have an extra amount of blood that with the high blood pressure is very much strain on the heart. Maybe it’s important to emphasize that it is difficult to persist on a diet. Normalization of body weight in obese patients can reduce blood pressure, or even to bring it to normal limits. In severe forms of high blood pressure, reduction of body weight makes drugs more effective. It should be noted that, with the aging, a large number of people get weight. The reason for this is the following: after 25 years of living organisms need 10 calories less per day for each year of life. Persons aged 50 need daily to consume 250 calories less (25 x 10). If you consume 100 calories more each day, (for example, one slice of bread), for a year you will get five kilograms in weight. Treatment of high blood pressure include reduced sodium intake. Large restriction of salt intake is not required. Recommended daily intake is up to one teaspoon of salt can reduce blood pressure by 10 mmHg. In order to consume a little bit of salt it is recommended to have a diet with more fresh vegetables and fruits. In food instead of salt, herbal spices and lemon should be added. Avoid canned products, savory meat and dairy products, as well as all other savory products including vegetables stored for winter (sour cabbage, peppers, cucumbers, etc..). In recent years there is increased interest in various relaxation techniques in the treatment of high blood pressure. This method can get good effects in mentally prestressed person. Although patients with high blood pressure easy can have a normal life, they will die from complications of untreated hypertensive cardiovascular disease within 20 years. Hypotension or low blood pressure blood pressure is lower than normal blood pressure, for each person in certain conditions and is a relative term.